When I first moved into this house I made actual lined drapes with the pleats for my family room. They were necessary because once upon a time the family room was the TV room of the house, and the afternoon/evening sun blazed in and disturbing viewing. But the windows were short, because the family room is in the basement. I made short lined blue drapes, crisp with pleats and curtain hooks. When I think back about them, I am kind of amazed at myself that I got them made as well as I did. No pictures, it was far too long ago. The curtains eventually succumbed to sun fade and cats. It was kind of a sad day when they came down for the last time. The lesson I learned was that I could make curtains. Now mind you, just because you CAN do something, doesn’t mean you WANT to. 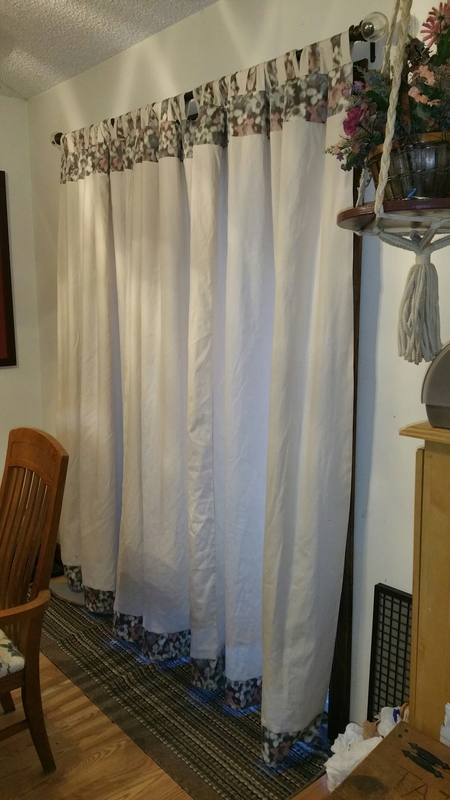 Six years ago, during a real, honest-to-goodness blizzard when work was cancelled and I was trapped at home, I made a project of making made lined, tab topped curtains for my large new replacement sliding glass door in the dining room. The new door had replaced French doors that I had made lace panels to fit top and bottom inside the frame for the glass. They were not “private”, but very pretty. The door had to be replaced eventually though and I opted for a sliding glass door. This door is huge, and it takes a lot of fabric to adequately cover it. As luck would have had it, I had a giant piece of lightweight wheat upholstery fabric that was given to me some time ago, and that I found was suddenly begging to become a new curtain. Applying measurements and math, I found was just short enough that I was not going to have enough to make curtains with adequate fullness — unless I got creative. With nothing but snow and time on my hands, I found some brown fabric that I added to the top and bottom, and tabs making my curtain a perfect fit. The lesson I learned from these curtains is I certainly can make them, but I don’t really like making them. Curtains this size are usually big, bulky, hard to measure in small spaces without using the floor, and really difficult to press on a standard ironing board. I have a short memory. Four or five years later, and having forgotten lessons, I decided I must finally re-cover the window formerly covered by the crisp blue pleated curtains. An inexpensive upholstery remnant from Pottery Barn, some white fabric for lining and they turned out pretty nicely. This particular window may be wide, but nice and short, so there’s not a lot of bulk required. It helped that the fabric was exactly wide top to bottom to not require much cutting at all. In December, I stained my bathroom cabinets. Turns out gel stain is apparently communicable. Note the lovely stain spot on the above large curtain. That stain isn’t coming out. At all. Ever. I also noticed that after six years of use, the curtain was pretty worn on the lower right corner too — lots of rubbing by dogs going in and out of the door. The brown fabric had faded, and there was no amount of starch that was going to make them look crisp again. I also had a big bolt of light beige upholstery fabric that was screaming at me, “make me curtains.” I used the prior curtains for measurements, found a nice coordinating upholstery fabric for the top and bottom, and set out to make curtains. Now I remember as I’m crawling on the floor — I don’t like making huge curtains. At all. But I’m committed, and here they are. I see errors — this fabric was wider than the original fabric and I didn’t account for that, so they’re pretty full. I also measured the lining without taking the top stripe in account, so the lining is a bit too short. But they’re done and I’ve decided I’m my own worst critic. They don’t have a spot on them so I’m happy. On to the next project. And it won’t be curtains. I have a new toy. I bought a Singer XL-400 sewing/embroidery machine. It replaces my starter embroidery machine, a Singer CE-100, which I hated. Or it hated me. I’m not sure which. Fortunately, things are working out better with the new relationship. I use the XL-400 for embroidery, and I still sew on my old metal Universal, or my Brother electronic. I’m finding myself somewhat ambivalent about the whole machine embroidery thing. On the one hand, there’s a science to it, and getting the embroidery to come out looking neat and professional is definitely something that requires practice. On the other hand, unless you are your own digitizer, you’re really just applying designs someone else has created to your stuff. It’s nice to personalize things, like the coin purses below, and even the kitchen set had a little bit of personalization on it, but it’s not like I actually made the artwork I’m using myself, I’m just interpreting someone else’s work. I’ll come to terms eventually I suppose. In the midst of making coin purses, I realized my fabric stash was a mess. If I can distract myself from the project at hand, I certainly will. I found the organizing project very liberating though and am glad I made time for it. I started the gift-giving season with a gathering apron for my cousin, who raises chickens. This apron was made from scratch, using the instructions found Sew4Home, http://www.sew4home.com/projects/kitchen-linens/easy-half-apron-jumbo-pockets, and then I embroidered it. Dollar Tree kitchen set – required disassembly to embroider. Jewelry travel pouch from Instructables for a friend who makes her own beaded jewelry. Inside of Jewelry Roll with two zippered pockets, an open pocket, and velcro ring holder. A giant foam finger required a custom Chiefs cuff and optional costume change cuff. My hubby carried it to the Chiefs v. Raiders game (we won, advancing to the AFC playoffs) on January 2nd. I created this cuff from scratch and it attaches with a velcro closure in the back. The Chiefs logos came from a licensed flag we bought specifically to cannibalize and add with Heat ‘N Bond. A couple of pre-made cheapo aprons that I embroidered. The green one was for a friend that does ceramics, and the red one I did for myself and used on Thanksgiving Day. This apron is a crafting tool belt apron I made several years ago. I’m not sure I remember where I got this idea from, but I’m thinking with a little modification, I could make this a little more user friendly and a cute addition to my project lineup. I also made a purse that I love, started on a base for a costume my husband is making for Comicon, and I worked very hard on an awesome RenFest dress for me. I’ll add pics of those to another article. And lastly, today’s project, which is the prototype for a craft show item I’m contemplating. This heart coin pouch is an “in the hoop” design from Five Star Fonts. My friend that does ceramics wants to combine talents and have a mixed media craft show display sometime in 2016, where we both sell our wares, so I’m pondering what is unique enough, cute enough, and quick enough to make in quantity to do that. And the back of this cute purse is a lovely blank space just begging for some sort of embroidered saying or appliqued initials. I’m still pondering. The next project I have planned is a sewing only project. I stained my bathroom vanity and medicine cabinet over the holidays using General Finishes Java gel stain. Gel stain somehow migrates all over everywhere if you’re not careful, and apparently I was not. I somehow managed to stain, and ruin in my estimation, my sliding glass door curtain (also made by me) while letting the dogs out. The good news is this project is all serging straight lines, the fabric I have was a gift, and I don’t have even measure that much, because I can use the current curtain as a guide. Hopefully I can get it done quickly. See the spot? The curtain is six years old and definitely showing wear so it’s time for a new one. But the bathroom looks amazing. It’s been a while, and I’ve been busy. I have a new embroidery machine, and made tons of cute personalized coin purses at Christmas. I’m working on aprons. And then there’s my latest project, pillows. The pillows were created from an unwanted king sized dust ruffle for a bed. The biggest constraint was the fabric was only 16″ wide, challenging the size of pillows I could make. I wound up with four 16″x12″ rectangular pillows, two 14″ bolsters, and a cute round sunburst pillow. I’ll post more later, but here’s pics of the pillows. These are for a friend, and a project I held off doing much too long. I was blessed to be sent a picture of the pillows on the owner’s bed.